The formation of new blood vessels seen in conditions commonly associated with Helicobacter pylori (H. pylori) infection, including gastritis, peptic ulcer, and gastric carcinoma, prompts consideration of a potential relationship between mucosal colonization by this organism and the angiogenic process. H. pylori directly or indirectly damages endothelial cells, which induces a number of changes in the microvasculature of the gastric mucosa. In H. pylori-associated conditions, that is, in gastritis, peptic ulcer and gastric carcinoma, there is an increased concentration of angiogenic factors, and subsequently a formation of new blood vessels. However, this early angiogenesis -which is activated to repair the gastric mucosa- is subsequently inhibited in patients with peptic ulcer, and ulcer healing is thus delayed. This may be due to the antiproliferative action of this organism on endothelial cells. While the angiogenic process becomes inhibited in infected patients with peptic ulcer, it remains seemingly active in those with gastritis or gastric cancer. This fact is in support of the notion suggested by various studies that peptic ulcer and gastric cancer are mutually excluding conditions. In the case of gastric cancer, neoangiogenesis would enhance nutrient and oxygen supply to cancer cells, and thus tumor growth and metastatic spread. Key words: Angiogenesis. Endothelial cells. Helicobacter pylori. Vascular endothelium growth factor (VEGF). Gastritis. Peptic ulcer. Gastric cancer. Angiogenesis, that is, the formation of new blood vessels from pre-extant ones, is a concept currently growing in interest both in the clinical medicine and basic science setting. This results from its potential role in the pathogenesis of various cardiovascular conditions (1), respiratory chronic inflammation by a number of organisms (2), rheumatoid arthritis, and diabetic retinopathy (3), in addition to tumor growth and resulting metastatic spread (4). Under physiologic conditions, the process of angiogenesis plays a role in bone growth and maturation, the menstrual cycle, and injury healing. In order that this process be carried out, endothelial cell (EC) proliferation and survival, or inhibition by apoptosis, is crucial. Major mediators in the adequate development of this process include members of the vascular endothelium growth factor (VEGF) gene class, fibroblastic growth factor, and angiopoietins among others, which play their role following interaction with their corresponding trans-membrane tyrosine-kinase receptors, mainly present on ECs. Helicobacter pylori (H. pylori) colonizes the gastrointestinal -mainly gastric- epithelium in a non-invasive way (5). This infection is a major cause of chronic gastritis, peptic ulcer, and gastric cancer (6). Given the implication of vessel neoformation in tumor growth and -apparently- the poorer course of various conditions, the relationship between H. pylori infection and angiogenesis has been increasingly studied during the past few years. 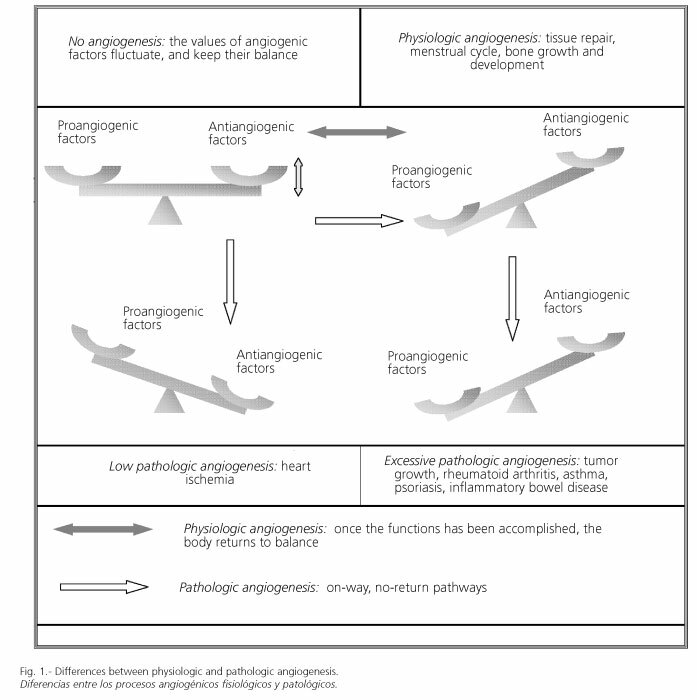 This review aims at unifying what to this day is known regarding said relationship between angiogenesis and H. pylori. To that end an Internet search was carried out through October 2005 using the PubMed search engine. The following descriptors or keywords were used (in all search fields): pylori AND (angiogenesis OR microvascular OR "endothelial cell" OR "vascular endothelial growth factor"). Studies assessing the effect of H. pylori on ECs and the formation of new blood vessels were selected, as well as experimental studies measuring the expression of mediators influencing and regulating any biologic mechanism in angiogenesis after bacterial infection, namely EC differentiation, proliferation, survival, migration, invasion, and adhesion. How does the angiogenesis process occurr? To understand the potential effect of H. pylori on the formation of new blood vessels following infection, the biologic mechanisms of angiogenesis should be first known. 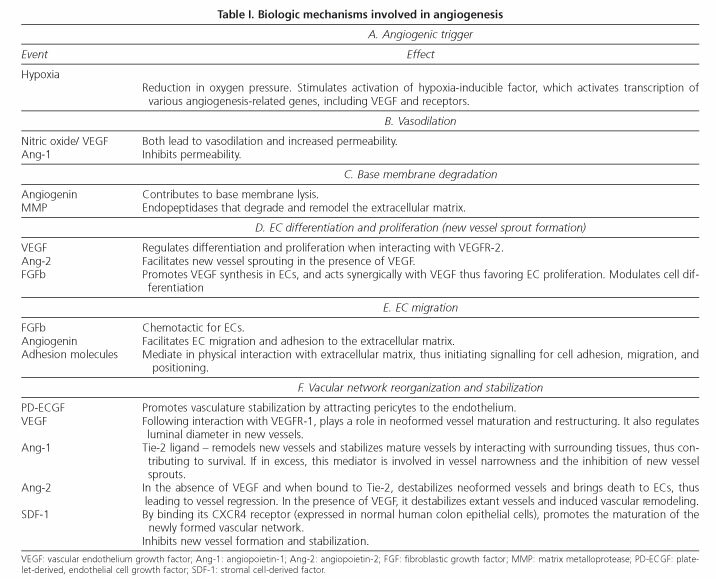 Overall, an angiogenic trigger (hypoxia, acidosis) is presumed to develop first thus inducing a change of mediators in the microenvironment of the organism or involved area, which would result in an irregular expression of both pro- and anti-angiogenic molecules (Table I). These molecules "decide" whether the vessel will expand, remain as it is, or regress (7). There is usually a balance between both mediator groups, but the balance inclines to one side following said angiogenic trigger (Fig. 1). Angiogenic activation is followed by vasodilation, which allows the extravasation of metalloproteases (MMPs); these in turn degrade the extracellular matrix and endothelial base membrane. ECs differentiate and proliferate under the action of selected growth factors and cytokines, particularly members of the VEGF gene family and angiopoietins. Then, these ECs migrate through the free space resulting protease disgregation and regroup to produce small developing sprouts. Finally the maturation of the vascular network depends on pericytes and various cytokines, including stromal cell-derived factor and its receptor, and platelet-derived growth factor (8) (Table I). Once the development of the angiogenic process is understood, physiologic and pathologic angiogenesis must be differentiated (Fig. 1). Physiologic angiogenesis is a process that is strictly regulated by a huge variety of cytokines, and occurs in injury repair, bone growth and development, and the menstrual cycle. Once angiogenesis has met its goals, angiogenic factors return to normal, that is, to their usual balanced status. In a way that remains to be elucidated, these factors on occasion do not return to normal balance, and an excess or deficiency in vessel formation ensues, which may favor the pathogenesis of a various diseases, including rheumatoid arthritis, psoriasis, proliferative retinopathy, and atherosclerosis, among others (1,3,9,10). A great variety of angiogenic factors exist, which may be classified as follows: a) pro-angiogenic, which induce angiogenesis; and b) anti-angiogenic, which inhibit the formation of new vessels (Table I). Proangiogenic factors include members of the VEGF gene family, fibroblastic growth factor, and angiopoietins, which seem to play a specific, crucial role in the formation of new blood vessels (11). It is a well known fact that H. pylori infection is the primary cause of gastritis, peptic ulcer, and gastric cancer, even though the exact mechanism why this bacterial organism contributes to their development in only selected individuals remains to be elucidated. H. pylori infection is usually associated in genetically predisposed individuals with severe inflammation, possibly as a result of an excessive immune response to bacterial proteins that the host identifies as antigens (Fig. 2). In fact, some in vitro studies show that bacterial surface proteins act as chemotactics for inflammatory cells such neutrophils and monocytes (12). In the inflammatory process, activated leukocytes are characterized by an increased synthesis of various cytokines and oxygen free radicals. While these mediators -most of them proinflammatory- are initially directed to defend the body against bacteria, such toxic substances may unintentionally damage epithelial cells, thus reducing mucosal resistance to gastric acid (13). Thus, the host's immune response itself, inflammation, and pH changes may as a whole result in gastric disorders, including gastritis, peptic ulcer, and gastric carcinoma. A major component of gastrointestinal inflammation is the disturbance of vascular structure and function. This statement is supported by endoscopic and histologic findings related to H. pylori infection, including erythema, edema, and vasodilation, as well as inflammatory cell infiltration (14). Several authors reported such disturbances in gastric microcirculation in the presence of H. pylori both in humans (15-17) and rodents in vivo (13,18). The precise cause of said vascular disorders is unknown, but a potential candidate is inflammation itself -as related to this organism's presence. Thus, a question to be asked is the way in which inflammation may affect vascular structure and function. In relatively recent papers, the use of in vivo fluorescence or intravital microscopy has revealed the major function exerted by leukocyte adhesion -associated with the inflammatory process- in microvascular gastric disorders in the presence of H. pylori (19). Also platelets seem to play a major role in inflammation and the subsequent vascular gastric disorders arising after H. pylori infection. Thus, platelets have been suggested to potentially generate -together with bacteria- highly toxic oxygen forms including the superoxide anion and hydroxyl radical; these induce platelet aggregation, which may result in microvascular disorders, even when they were initially directed to defend the host (20). In addition, activated platelets express P-selectin in their surface, which not only facilitates their adhesion to monocytes and neutrophils but also makes these cells ready for the subsequent immune response, thus enhancing inflammation (21). On the other hand, EC apoptosis has been seen under inflammation or atherosclerosis conditions, which would result in a loss of anticoagulating properties, and in their circulation as coagulating bodies much in the same way as platelets (22). So, both leukocyte adhesion and platelet aggregation or EC apoptosis may give rise to small vessel-blocking thrombi, which would alter blood flow (19). These changes may favor microvascular gastric disorders following infection by H. pylori. The gastric mucosa requires an adequate blood flow to maintain tissue viability and to perform its main physiologic activity. A reduction in blood flow to the gastric mucosa would allow intramucosal proton accumulation, which in association with other factors may alter pH and hence result in cell damage (19). Therefore, it may be said that, following H. pylori infection, a wide variety of microcirculation components become disturbed, including blood flow, vessel diameter, sedimentation rate, leukocyte and platelet activity, and even EC activity (19). How does H. Pylori infection act upon ecs? ECs are a potential target for a wide variety of mediators, and a key factor in angiogenesis. This is due to the fact that EC differentiation, proliferation, migration, and invasion represent crucial stages for this process. Thus, the study of ECs in the presence of H. pylori is important, but the literature on this topic is scant. EC activation may favor chronic inflammation following H. pylori infection, as these cells may increase vascular permeability. The bacterium may in turn change the biologic functions of these cells, be it their proliferation and apoptosis, or their migration and invasion. Several research teams have focused on the study of epithelial cell proliferation and apoptosis (23-27), but the literature about these biologic mechanisms in ECs is scarce (13,28,29). Various in vitro studies using H. pylori water extracts converge in demonstrating an antiproliferating effect on ECs that is independent of bacterial VacA and cagA genotypes (13,28-31). In the presence of H. pylori S-phase ECs seemingly diminish, which suggests a blockage of the G1-S transition (29). This antiproliferating action on ECs may be reverted by the addition of monoclonal antibodies against tumor necrosis factor alfa (TNF-α), which suggests that this cytokine is involved in H. pylori-induced cytostasis (31). This mitogen is synthesized in the gastric mucosa particularly after H. pylori-related damage, and attenuates EC proliferation at cell cycle level (32). The balance between apoptosis and cell proliferation is relevant for sustained gastric homeostasis, and a loss of balance may lead to the development of gastric tumors, which has been associated with H. pylori infection (33,34). There is evidence that EC apoptosis follows stimuli such as lipopolysaccharides or TNF-a (13,35). Recent in vitro studies have shown the apoptosis of human umbilical vein ECs (HUVECs) following the addition of H. pylori water extracts to their cultures (28). However, other authors could not confirm these findings (30). This controversy may well result from different magnitudes in the bacterial innoculum added to cell cultures, or the various techniques used to measure apoptosis rates. The first study (28) was based on the research of proteins closely linked to the apoptotic process, namely p21 and p53; the second study (30) quantitized cell death by using a lactate dehydrogenase assay. 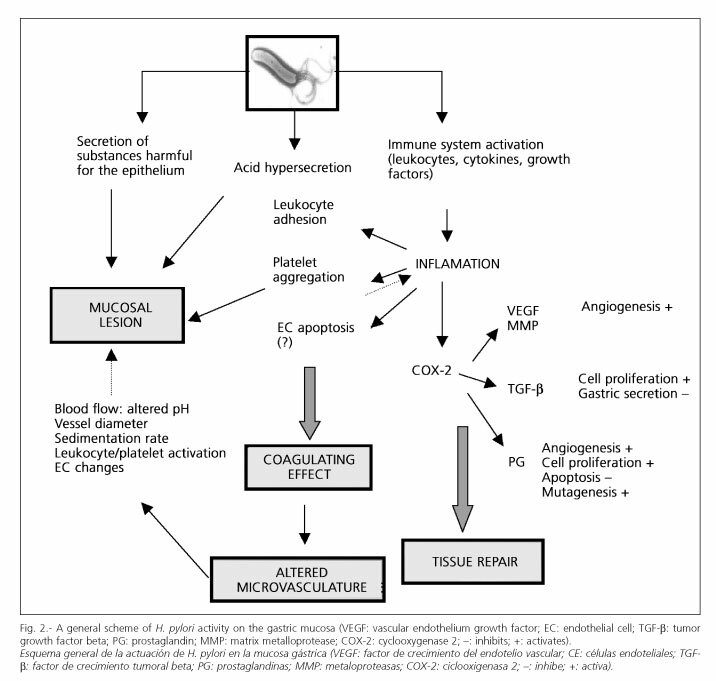 Under inflammatory conditions, which are invariably present after H. pylori infection, an increase in the microvascular endothelium's apoptotic rate has been shown to entail increased coagulation and permeability, which may alter blood flow and favor an extravasation of mediators to disturb the host organism. All this may in turn bring about a loss of balance between pro- and anti-angiogenic molecules (17,22,36). H. pylori, in addition to cytostasis induction and EC apoptosis modulation, may have cytotoxic effects capable of activating leukocytes and other inflammatory cells, thus inducing epithelial damage and ulcer formation (13). On the other hand, no EC chemotaxis or migration has been reported in the presence of this bacterium, which may be surprising when considering that EC migration is a critical step in angiogenesis regarding the formation of a new vessel (29). Atrophic gastritis is considered a precursor lesion of intestinal-type gastric cancer, which is associated with hypergastrinemia and the ensuing induction of cyclooxygenase 2 (COX-2), whose products seem to be responsible for delayed apoptosis and angiogenesis in gastric cancer (37). COX-2 is inducible in inflammatory responses, and seems to stimulate NFkB expression, which in turn activates proinflammatory cytokines (IL-8, IL-6, IL-1) and reactive oxygen species (37). COX-2 may play a critical role in a number of gastric conditions related to H. pylori infection, since various studies have shown that bacterial eradication is followed by a decrease in COX-2 gene expression (38,39). Regarding the angiogenic process, a higher blood vessel density has been reported for gastric mucosa samples from patients with H. pylori-positive gastritis versus patients with H. pylori-negative gastritis (40). These values significantly correlated to the expression of hypoxia-inducible factor 1-alfa (40). Such results are none the least surprising, since the higher the expression of hypoxia-inducible factor 1-alfa, the greater the stimulus for transcription in some angiogenic genes which would translate into angiogenesis-enhancing proteins. A very recent study has shown a direct relationship between VEGF concentrations and new blood vessel development; gastric mucosal neovascularization was also reported to be significantly higher at the antrum of patients with H. pylori-positive gastritis versus non-infected individuals (41). This neovascularization was seemingly also reported in the gastric body, but with statistically non-significant differences (41). This may result from the fact that G cells, mainly located at the gastric antrum, are responsible for gastrin synthesis and release (41). In turn, gastrin seems to stimulate COX-2 expression (42,43), which may lead to increased VEGF expression (44,45). Another research team has reported an increased VEGF expression -both the protein and mRNA- in the normal gastric mucosa of patients not infected by H. pylori when compared to infected subjects (41). In contrast, other authors reported no such differences regarding mRNA in patients with gastritis according to their being infected by H. pylori or otherwise (8). Such discrepancies may result from inflammation itself, since one group compared the normal mucosa of patients with and without H. pylori infection (41), and the other group included patients with chronic gastritis (8). VEGF induces most of its angiogenic effects following its interaction with a trans-membrane tyrosin-kinase receptor -VEGFR-2 (46). The expression of this receptor seems to be reduced both in HUVEC cultures in the presence of H. pylori (30) and H. pylori-infected gastric mucosa (8). However, other papers report no such decreased expression (41). Such inconsistencies may result from the methodology used to measure VEGF receptor expression, or from differences in the control population (41). From the aforementioned papers it may be concluded that angiogenic factors are usually overexpressed in the gastric mucosa of patients with H. pylori infection, and that angiogenesis is probably increased in such individuals. Once a peptic ulcer has developed, angiogenesis could be logically considered to become activated in order to help in ulcer healing and epithelial repair. This process is essential, as it facilitates oxygen and nutrient supplies to injury sites, as well as the clearance of necrotic tissue, thus facilitating repair mechanisms (29,30,47). However, a number of experimental studies show delayed ulcer healing in the presence of these bacteria, and usually relate it to a potential inhibition of angiogenesis (30,48-53). On the one hand this delayed healing of ulcers would attenuate tissue repair; on the other hand, the sustained contact with bacterial antigens may increase epithelial damage. Both events may lead to chronic ulcer development, and not only to the appearance of acute lesions in the gastroduodenal mucosa (52,54,55). Some cytokines, including interleukin 8 (IL-8), IL-6, and TNF-a, are stimulated by H. pylori as a component of the latter's pathologic mechanism, which might inhibit ulcer healing through an angiogenesis attenuating effect (31). While ILs do not seem to affect EC proliferation and apoptosis, TNF-a is indeed involved in H. pylori-induced EC cytostasis (29-31). The expression of proangiogenic factors such as VEGF, endothelin-1 or nitric oxide has been studied in H. pylori-positive ulcers in various stages: active ulcer, healing ulcer, and healed ulcer (56). A greater expression of these factors in active and healing ulcers seems to predominate versus healed ulcers, which suggests that these factors play a role in angiogenesis, vascular remodeling and mucosal regeneration during ulcer healing (56). On the other hand, subsequent in vitro investigations using molecular biology techniques have suggested that no such changes exist in the production of VEGF and angiopoietins in the presence of H. pylori (30). Regarding the expression of VEGF mRNA, however, no significant differences have been reported between patients with active ulcer, healing ulcer, and healed ulcer (8), and H. pylori seemed to have no influence on their regulation (30). The same was the case with other factors, including angiopoietins, which were also subjected to no bacterial influence (30). Regarding VEGF receptors, KDR and Flt-1, a significant increase in both mRNAs has been seen in active ulcers versus healing and healed ulcers (8). However, protein and mRNA expression for these VEGF receptors is reduced in infected patients with peptic ulcers (8,30). Thus, it may be concluded that there possibly exists an activation of the angiogenic process early in ulcer development, and that this process is subsequently inhibited in the presence of this bacterium; so then, new vessel formation is eventually inhibited in infected patients with peptic ulcer. In summary, H. pylori infection seems to induce a deficient angiogenesis in associated ulcers, that is, has an antiangiogenic effect besides its antiproliferating action on ECs in these patients. H. pylori infection represents a highly relevant factor in the pathogenesis of gastric cancer (37). This may be due, at least partly, to the stimulated expression of genes involved in mucosal defense, inflammatory response, angiogenesis modulation, and tumor suppression by H. pylori (57). The two types of histologically distinct gastric cancers -intestinal and diffuse- differ in the combinations of multiple genetic and epigenetic changes involved in the various stages of carcinogenesis in the human stomach (58). Both seem to be associated to H. pylori infection in a similar way (58). H. pylori infected patients with gastric carcinoma have a higher density of blood vessels when compared to patients with this tumor following H. pylori eradication (59). Therefore, it has been suggested that H. pylori eradication may influence tumor vascularization in gastric carcinoma (59). The results from some studies suggest that the H. pylori cagA+ strain may play a critical role not only in tissue remodeling, angiogenesis, or injury healing, but also in the process of extracellular matrix degradation, tumor invasion, and metastatic spread (37,60,61). This may result from the fact that cancerigenous gastric cells in the presence of H. pylori cagA+ strains stimulate the expression of urokinase-type plasminogen activator and its receptor (60). This increased expression changes following treatment with a NFkB inhibitor, and these findings thus suggest that cancerigenous cells vary the expression of selected mediators involved in neoangiogenesis through the transcription factor NFkB (60). Platelet-derived growth factor is proangiogenic and is highly expressed by gastric carcinoma (62), while this expression seems to be independent of H. pylori infection in developed tumors (63). However, this infection results in increased numbers of nonspecific inflammatory cells, which may increase the expression of platelet-derived growth factor in premalignant lesions such as intestinal metaplasia, which may help originate a microenvironment supporting tumor development (63). Furthermore, it seems that nuclear apoptotic protein p53 is related to gastric carcinoma vasculature, and correlates with COX-2 expression (64,65). In turn, COX-2 is involved in VEGF overexposure in human gastric cancer in the presence of H. pylori (66,67). In vitro cocultures of gastric carcinoma cells and H. pylori induce an increase in mRNA expression for IL-8, VEGF, angiogenin, urokinase-type plasminogen activator, and MMP-9 in said cells (34) (Table I). Some studies suggest that H. pylori may influence the expression of MMP-9 and VEGF, and promote gastric cell invasion via COX-2- and NFkB-mediated pathways (33). Similarly, COX-2 inhibition results in decreased angiogenic factors, and in changes in MMP activity (68). In summary, COX-2 seems to be inducible in response to cytokines, mitogens, growth factors, and the presence of H. pylori, and may induce carcinogenesis via mechanisms involving apoptosis inhibition, cell proliferation increase, and angiogenesis increase (64). 1. It influences the expression of various angiogenic factors (34,69-71), and may directly activate proangiogenic pathways in the gastric mucosa (72). 2. Its colonization of the gastric mucosa results in inflammation, which may induce microvasculature disorders (13,18). 3. The presence of infection is associated with a higher density of blood vessels in clinical conditions such as gastritis and gastric cancer (40,41,59). 4. H. pylori eradication accelerates ulcer healing (73,74). This may suggest an altered expression or regulation of some repair-inhibiting angiogenic mediators in the presence of this bacterium. The first conclusion that may be drawn from this revision contents is the presence of a stimulating or inhibiting effect on angiogenesis depending upon each H. pylori-associated condition. In this way, conditions such as gastritis and gastric cancer would be associated with a proangiogenic action, whereas such action would be attenuated in peptic ulcer. Thus, this organism seems to inhibit both the angiogenic trigger and vessel maturation in ulcer healing (30); however, blood vessel neoformation is seen in H. pylori-infected patients with gastritis (40,41) or gastric carcinoma (59). Angiogenesis is activated early in H. pylori-infected patients with peptic ulcer in response to local hypoxia, and becomes progressively attenuated for some still unelucidated reason, although recent studies suggest a disturbance of mediators involved in blood vessel neoformation (30,53). This review was partly supported by a grant from Instituto de Salud Carlos III (C03/02), and a grant from Schering Plough. Playa de Mojácar, 29. Urb. Bonanza. 28669 Boadilla del Monte. Madrid.